The winning Primary School poem. 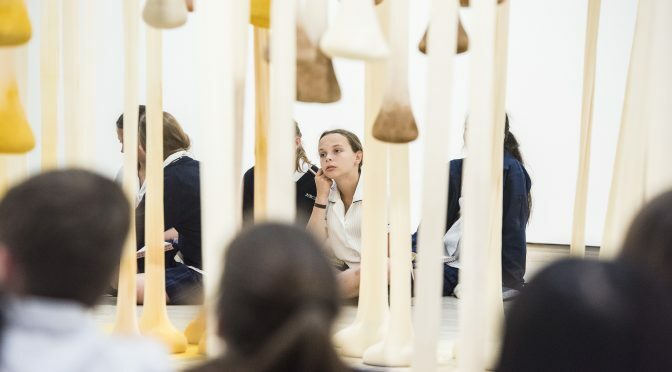 From Red Room Poetry, whose vision is to make poetry a meaningful part of everyday life, the winners have just been announced for Poetry Object which is Australasia’s largest free poetry writing competition for students and teachers (Years 3-10). Poetry Object ignites imaginations by inviting young writers to create, publish and submit poems inspired by special objects. The Guide had the opportunity to get a little more background from Emma Rose Smith who heads the project. SAG: Congratulations on the eighth year of Poetry Object. The objects which the young writers choose are incredibly diverse, both manifest and shrouded. I was very much taken by ‘Breathing Object’ which is delightfully obtuse and by Year 8 student! Why focus the attention of the poets’ work to an object rather than a theme or idea? EMMA: It is a beautiful poem! When young poets write about their special, curious or talismanic objects, it often brings up things like heritage, personal worlds, friendships and identity. Because it happens via their objects, it comes about in a natural way – rather than enforcing a theme in a top-down way, we let the poets decide for themselves what the meaning will be. Humans tell stories through objects; they themselves are metaphors for our existence. SAG: There were over 2500 entries this year, down to a shortlist of 72 works, do you find that the poems have explorations in common? Do the entries reflect our life and times, do young people share a vision or concern? EMMA: Patterns often emerge in the poems submitted. We read a lot of poems about jewellery, family heirlooms, and spiritual objects. Around the age of middle school, a lot of young poets write about their bedrooms as a sanctuary, away from the stress of social worlds and work. So it seems they are learning young that sometimes you need a place all to yourself. Many other poems talk about social inequality, climate change, intergenerational loss, and hopes for the future. We get to read the words of some astute and self-aware individuals. We are often amazed by the emotional maturity of the lines expressed – and teachers often say that poetry is a processing and transcendental mode of expression for their young people. SAG: What about styles? Are young people still interested in rhyme or does the rhythm of rap predominate at the moment? EMMA: Styles are mixed – our learning resources model a range of poetic forms and techniques, and offer the suggestion that poetry does not have to rhyme. SAG: There’s considerable geographic variety in where the entries come from. From ‘The Wave’ written by a Year 5 student living near the ocean and ‘Grandma’s Special Doll’ entered by a Year 7 student with the Alice Springs School of the Air. It must be wonderful to have the Red Room connecting with young people from so many different areas? 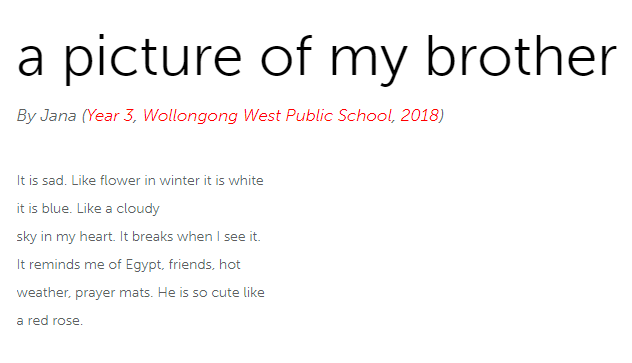 EMMA: We receive poems from schools all around Australia, New Zealand and beyond, including communities in regional and remote areas. It’s wonderful to us that we can offer the learning resources for free, and align them to curriculum codes so that it’s as smooth as possible for teachers anywhere to pick them up and use them in a classroom. We also create special workshops with professional poets, which gives us the opportunity to work with poets in all of these locations to have a face-to-face interaction. Either way, the scope is exciting – Poetry Object is the largest competition of its kind in Australasia! SAG: Having just retired after 43 years at the chalkface I think including teachers is an inspiring concept. The personal creativity of our educators can be easily overlooked by both their students and the parents and congratulations on foregrounding their work. I imagine many teachers are a bit too shy about their work to enter? EMMA: We love the teacher category. Poems written by educators are often profound! We always want more entries – I don’t know if it’s shyness or something else (being busy? ), but often a full class submits excellent poems and their teacher doesn’t submit anything, and I wonder what we’re missing out on. SAG: The prizes are considerable but I expect the opportunity to see their work enjoyed by a broader audience is quite a motivator for the participants. Plus there is an animated short film created of the first prize winners. EMMA: Yes, the prizes are a huge motivator, and one of our biggest focus areas is publication of poetic works. All poems submitted are published in our online library – we have over 15,000 so far, from the eight years that the project has been running. Plus the winning poems are published in magazines for young people, and in the animation (which has an audience of about 53,000 through the cinemas!). 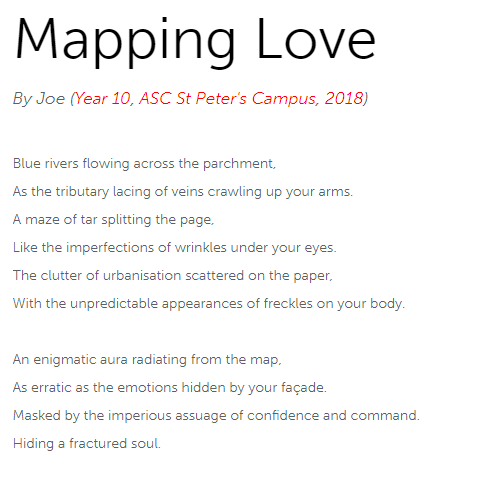 This year we also created a new learning resource, Poems to Share II, which takes our favourite poems from Poetry Object so far and puts them on cards that teachers can use in the classroom to inspire new poems and show off various poetic techniques. So yes, we try to show off the creativity of these young people whenever we can! SAG: The competition reaches far beyond the excitement of the announcement today. There’s a Poetry Object Library and many learning resources and it’s been 15 years that Red Room has been bringing poetry to Australians, are you finding a generational legacy? EMMA: Red Room Poetry has acted as a kind of de facto index of local contemporary poets. All of the professional poets we work with feature on our website, which means that you can trace several poetry movements over the last 15 years via the masterminds we’ve worked with. Poets often start with us when they’re emerging, and continue as they become more established – standout poets from recent projects include Candy Royalle, Ali Cobby Eckermann, Eunice Andrada, Omar Sakr, Evelyn Araluen, Lorna Munro, David Stavanger, Toby Fitch, Eileen Chong, Jeanine Leane, Bella Li, Maxine Beneba Clarke, Gabrielle Journey Jones, Emilie Zoey Baker and Scott-Patrick Mitchell. We hope that these poets receive professional development skills and economic stability through the projects we work on together. And in terms of education and young people – many students and teachers submit to Poetry Object several years in a row, often receiving accolades more than once and hopefully kicking off a long future of writing and reading poetry. You can see all the winners of Poetry Object from Red Room Poetry below. Winner: ‘Night Sky’ created by Year 6 class group at MLC School Burwood.